For other uses, see Coalescence (disambiguation). Representation of the coalescence of two droplets, bubbles, or particles to form a single entity. 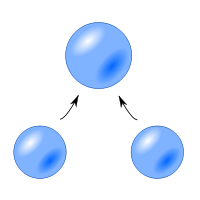 Coalescence is the process by which two or more droplets, bubbles or particles merge during contact to form a single daughter droplet, bubble or particle. It can take place in many processes, ranging from meteorology to astrophysics. For example, it is seen in the formation of raindrops as well as planetary and star formation. In meteorology, its role is crucial in the formation of rain. As droplets are carried by the updrafts and downdrafts in a cloud, they collide and coalesce to form larger droplets. When the droplets become too large to be sustained on the air currents, they begin to fall as rain. Adding to this process, the cloud may be seeded with ice from higher altitudes, either via the cloud tops reaching −40 °C (−40 °F), or via the cloud being seeded by ice from cirrus clouds. In cloud physics the main mechanism of collision is the different terminal velocity that between the droplets, the terminal velocity is a function of the droplet size. The other factors that determine the collision rate is the droplet concentration and turbulence. ^ Benmoshe, N.; Pinsky, M.; Pokrovsky, A.; Khain, A. (2012). "Turbulent effects on the microphysics and initiation of warm rain in deep convective clouds: 2-D simulations by a spectral mixed-phase microphysics cloud model". Journal of Geophysical Research: Atmospheres. 117: n/a. doi:10.1029/2011JD016603. Look up coalescence in Wiktionary, the free dictionary. Wikimedia Commons has media related to Coalescence (physics).